Centipede made by a girl? Just very recently, I found out that the old arcade game Centipede was programmed by a woman – Dona Bailey – the only woman programmer at Atari at the time. 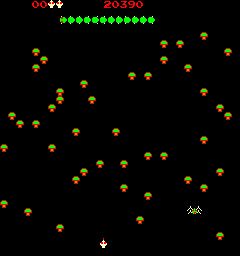 Although I sucked mightily at the game, I always loved Centipede. Unfortunately, the industry was not kind, nor did it recognize that she was worth keeping. Yes, but I’m not sure it was for the better! There was a lot of surly attention after that. It’s not always popular to do something [like] that — the first thing that happened, I was not ready for at all, and I still haven’t figured out how to deal with this part — people just started, y’know… the typical kind of thing that people would say was, either it was a fluke or I didn’t really do it, somebody else did it. I’m a very peaceful person, and I felt sick of fighting, so I really just disappeared, and I haven’t had contact with the industry for at least twenty years. Eh, what can I say? Men weren’t very open to women in the industry then, and while I understand it is better now, I’m sure there are still places where women are viewed as outsiders to the gaming industry. Regardless of that, though – the entire interview is pretty cool to read, really. She pretty much left gaming not too long after the success of Centipede, but is now back into it somewhat – she teaches a game design course at the University of Arkansas at Little Rock. While reading a commentary at Coding Horror on the fallibility of tabbed interfaces, I found reference to a really slick tool for better managing windows, processes, and yes, even tabs in Windows. Called Enso Launcher, this application gives you a stupidly simple method of finding the program or tab you want to use. On average, it takes over 10 seconds to open Notepad using the Start menu–and that’s if you happen to remember that Notepad is in the Start menu. By the time you find it, you’ll probably have forgotten what you wanted to jot down in the first place. Enso Launcher typically takes just over half a second-20 times faster than the Start menu. nso Launcher’s open command places applications, websites, and files at your fingertips. No more time wasted digging through the Start menu; no more time spent learning your web browser’s latest Bookmarks system. Enso Launcher even passes the Over the Phone Test-which the Start menu certainly doesn’t do. To see how all this works, click on the movie below. There is a video on the site (which plays inline, so you don’t need to open another program or anything) showing just how simple the tool is to use. After having looked at this tool, I decided to check out their other product – Enso Words – and let me tell you – this is the Humanized tool that really caught my interest. It is a universally accessible (for universal values equal to the computer you have it installed on and running) spell-checker that’s damn smart about working with you to correct spelling errors. From what I’ve seen of it, this is a real gem. Spell check is a fundamental: wherever you type, you’ll need to check spelling. So why isn’t it available everywhere? With Enso Words, it is. From Microsoft Word to Mozilla Firefox to Macromedia Fireworks, Enso Words gives you a spell check that makes the others jealous. It’s simple and it’s elegant: it really feels like magic. There is a video (again, inline) on the page that shows just how slick and smart this tool is. It’s a $20 (minus a nickel) purchase with a free trial download available. I plan on testing this on my desktop today or tomorrow when I have a few free minutes. If it works just as well as it appears to in the videos, I’ll be getting spendy on it. This looks to be even more useful and accessible than the online spellchecked SpellJax that I highlighted here recently in the asides section (right sidebar).